How Pain Concern’s Navigator Tool can help focus pain appointments. This edition has been funded by funded by the Health and Social Care Alliance and Edinburgh and Lothians Health Foundation. In 2015 Pain Concern released its report ‘Breaking barriers to self-management of chronic pain in primary care’, marking the end of the first part of its ‘Breaking Barriers’ project. Its aim was to highlight the commonly occurring barriers that patients faced during one-to-one appointments with healthcare professionals, and to advance the primary care management of chronic pain. Phase two of the project was to produce a ‘navigator tool’ to break down those barriers and prepare patients and GPs in order make the most out of their appointments. Phase two is now complete, and in this edition of Airing Pain, Paul Evans speaks to the researchers, patients, and healthcare professionals that allowed this project to happen. Reneé Blomkvist, Pain Concern’s researcher heading the project’s second phase, explains the established barrier in phase one, as well as the methodology used in preparing the navigator tool. Paul speaks to GP study participant Dr John Hardman, who has a particular interest in chronic pain, about his experience piloting the tool and how it allows both patients and GPs to focus their appointments. 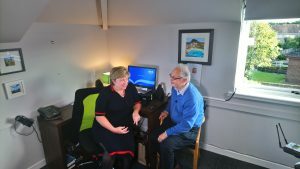 We then visit the University of Dundee to hear from the Scottish Government’s Lead Clinician on Chronic Pain and member of the research steering group, Professor Blair Smith, about his views on the role the navigator tool could play in helping people conceptualise and discuss their pain. At St. Triduana’s Medical Practice in Edinburgh, Lucy and her GP Dr Louise Bailey talk about their experiences in using the tool, and how the practice is trying to use supported self-management to further help its patients. To find out more about the history of Pain Concern’s Navigator Tool project and to try it out for yourself, please visit our Easing Pain Appointments page.